There’s a saying, “What’s good for your heart is good for your brain.” Evidence supports preventing or controlling cardiovascular conditions such as high blood pressure to protect brain health as adults grow into old age. One in three American adults has high blood pressure, putting them at risk for heart diseaseand stroke, conditions that are among the leading U.S. killers. High blood pressure (also called hypertension) can also impact brain health in significant ways. That’s reason enough to check blood pressure regularly and treat it if it’s high, experts say. How blood pressure affects cognition—the ability to think, remember, and reason—is less well understood. Observational studies show that having high blood pressure in midlife—the 40s to early 60s—increases the risk of cognitive decline later in life. In old age, the impact of hypertension is not so clear. In these studies, researchers are investigating how long-standing high blood pressure may harm the brain and lead to cognitive problems. In addition, several blood-pressure drugs and lifestyle changes to control cardiovascular risk are being tested to see if they can maintain or improve cognition in older adults. “The possibility that controlling hypertension might help delay or prevent cognitive impairment is something we are looking at closely, as hypertension is easily treatable with lifestyle changes and medication,” said Lenore J. Launer, Ph.D., chief of the Neuroepidemiology Section in NIA’s Laboratory of Epidemiology and Population Sciences. At first glance, the connection between blood pressure and the brain makes perfect sense. While only about 2 percent of body weight, the brain receives 20 percent of the body’s blood supply. Its vast network of blood vessels carries oxygen, glucose, and other nutrients to brain cells, providing the energy the brain needs to function properly. The blood flow that keeps the brain healthy can, if reduced or blocked, harm this essential organ. Uncontrolled high blood pressure plays a part in this damage. Over time, the force of blood pushing against arteries may cause blood vessels to become scarred, narrowed, and diseased. This damage can hamper blood flow to many parts of the body, including the brain. High systolic blood pressure, the top number in blood pressure readings, is considered especially important to monitor as people age. “The reality is that multiple pathologies in the brain all contribute to cognitive decline,” Dr. Launer said. The types of pathologies high blood pressure leads to include cerebrovascular damage—such as a major stroke, series of small strokes, white and gray matter shrinkage, and microinfarcts (tiny areas of dead brain tissue)—and possibly the plaques and tangles typical of Alzheimer’s disease. Exactly how high blood pressure contributes to vascular brain damage, and how vascular and dementia-related brain processes may interact biologically, is under study. High blood pressure is common, affecting one-third of American adults and nearly two-thirds of adults age 60 and older. Many people don’t know they have “the silent killer” because it has no symptoms. Only about half of people with high blood pressure, including those who treat it with medication, have it under control. For more information, read NIA’s High Blood Pressure, and visit the websites of the National Heart, Lung, and Blood Institute and the Centers for Disease Control and Prevention. After decades of observational research, there’s general agreement that high blood pressure in middle age is a risk factor for later-life cognitive decline, including overall cognition, memory, and processing speed. Much of the data comes from studies of large groups of adults who were followed for many years. For example, the NIA-supported Honolulu-Asia Aging Study measured cognition in 3,734 Japanese-American men in Hawaii, with an average age of 78, who’d had their blood pressure measured more than 20 years earlier. Researchers found that for every 10-mmHg increase in systolic blood pressure, there was a 9 percent increase in risk for poor cognitive function. Similarly, the Atherosclerosis Risk in Communities neurocognitive study followed more than 13,000 white and African-American adults, starting at age 48 to 67, for 20 years. In later life, performance on cognitive tests of short-term memory, executive function, and processing speed fell for all participants. Those with high blood pressure (systolic blood pressure of 140 or greater and/or diastolic blood pressure of 90 or greater) or prehypertension (systolic blood pressure of 120 to 139 and/or diastolic blood pressure of 80 to 89) at the start of the study scored worse than those with normal blood pressure. Participants who used drugs to treat their high blood pressure scored better than those with untreated hypertension, but not as well as those with normal blood pressure. These and other studies are consistent with the conclusion that controlling blood pressure in midlife—years before most people become concerned with age-related cognitive loss—might help maximize the potential for protecting brain function later in life. What about older adults with high blood pressure? Can they reduce their risk of cognitive decline by controlling newly diagnosed hypertension? Research findings so far have been inconsistent. One NIA-supported epidemiological study suggested that taking blood pressure-lowering medications may reduce the risk of Alzheimer’s dementia. Another study found that slightly elevated blood pressure may be important for lowering the risk for cognitive impairment in adults 90 and older. Despite this observational evidence, clinical trials—the gold standard of medical proof—have not shown that controlling high blood pressure through specific drugs or lifestyle changes can prevent cognitive decline or Alzheimer’s dementia. 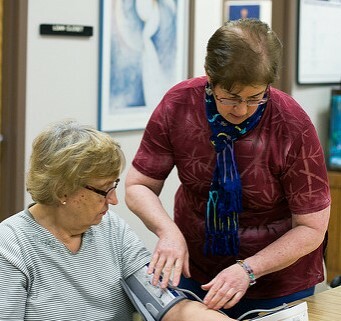 The landmark Systolic Blood Pressure Intervention Trial (SPRINT), which included 9,300 participants, ended in 2015 with a positive finding about blood pressure control and heart health: Lowering systolic blood pressure to less than 120, which is below the hypertension threshold of 140, significantly reduced the number of deaths and cardiovascular events, such as heart attack and stroke, in nondiabetic adults age 50 and older. Similar results were found for about 2,600 participants age 75 and older. The Memory and Cognition in Decreased Hypertension (MIND) add-on study is comparing the two blood-pressure targets for their impact on cognitive function and dementia in SPRINT participants. About 640 of them are having brain scans to look for vascular disease and changes in brain structure. The trial is sponsored by the National, Heart, Lung, and Blood Institute, with support from NIA, the National Institute of Neurological Disorders and Stroke, and National Institute of Diabetes and Digestive and Kidney Diseases, all part of the National Institutes of Health. Understanding the many connections between the heart and the brain will take time, and questions abound: Are there certain drugs, exercise routines, or diets that benefit or harm cognition? How long should beneficial steps be taken to make a difference? What doses are effective? Would certain people benefit more than others? Intensive Versus Standard Blood Pressure Lowering to Prevent Functional Decline in Older People—testing two blood-pressure drugs in people age 75 and up to compare their effects on cognition and mobility. Candesartran vs. Lisinopril Effects on the Brain (CALIBREX)—seeking adults age 60 and older with high blood pressure and executive mild cognitive impairment for a trial comparing the effect of two blood-pressure drugs on executive function. Early Detection and Prevention of Mild Cognitive Impairment due to Cerebrovascular Disease—recruiting adults age 55 and older with mild cognitive impairment and a vascular risk factor such as hypertension to study the impact of controlling vascular risk factors. Telmisartan to Prevent Alzheimer’s in African Americans—testing an angiotensin receptor blocker for its effect on adults age 45 and older with treated high blood pressure. Carvedilol in Alzheimer’s Disease—looking for adults with Alzheimer’s disease to determine if this beta-blocker improves memory.